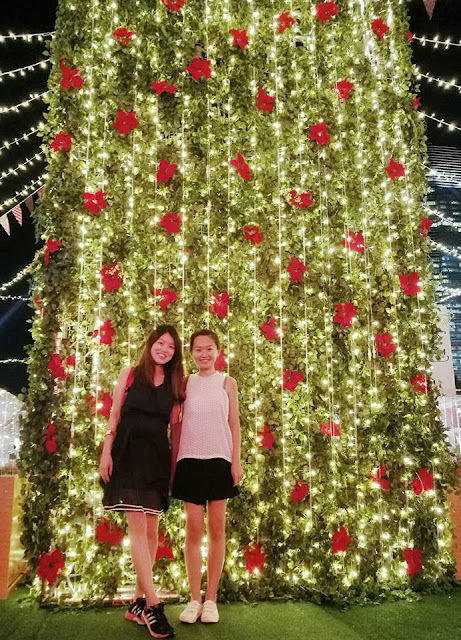 I sincerely think I am not a good blogger because I often blog when good things are already over (or I don't, at all), and SAVOUR 2016 is one such example. 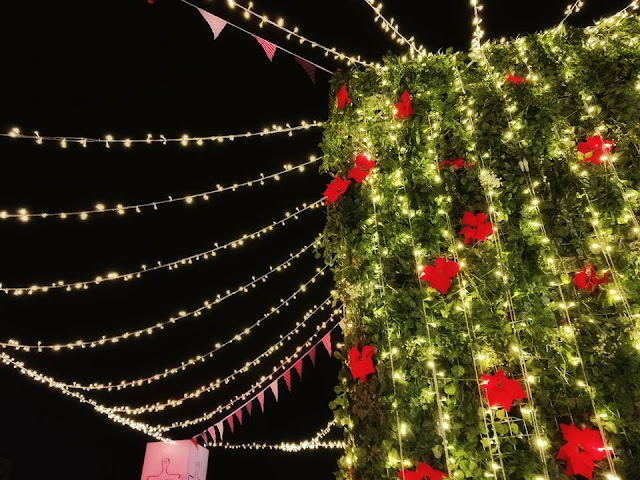 It has come and gone last weekend, and if you didn't try it... don't be too sad, apparently Savour organizes a few events a year and you can always wait for the next one! 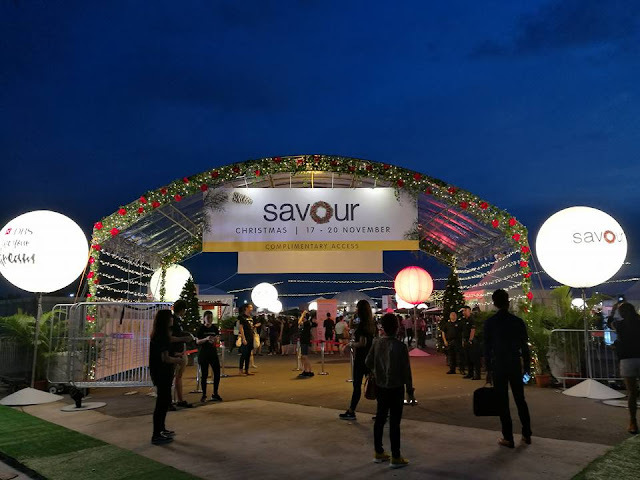 I really enjoyed SAVOUR 2016 Christmas this time and I definitely foresee myself going for their events the next time. Christmas is lookin' a lot more sleek & delicious with the weekend at Savour! This time, the food market selections are priced at $6 or $12 depending on how premium the food item is. And... the best part, DBS/POSB cardholders get 10% off. Such is the love-hate relationship with DBS. We have to first top-up a certain sum of money into a wristband and then go around for a cash-free food market experience. Great idea. Plus, it's not tooo crowded as I thought it would be or as this fantastic food market deserves. The queues I would say move at a fairly decent speed, and lucky for us, the weather was extremely cooling for Singapore! 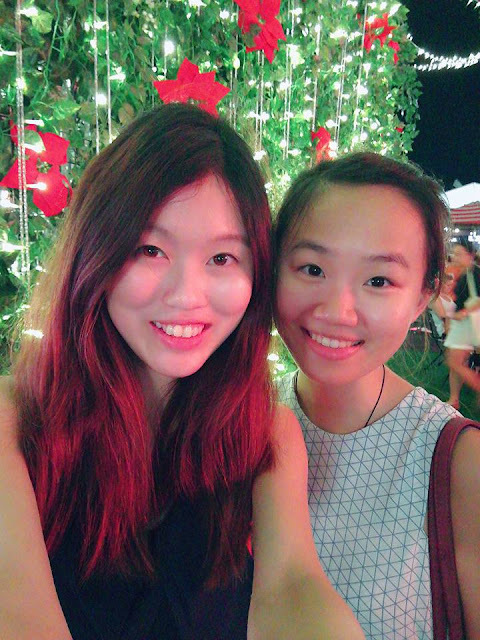 Let's begin our food trail at Savour 2016! Black Truffle Pasta - SGD5.40 after disc. 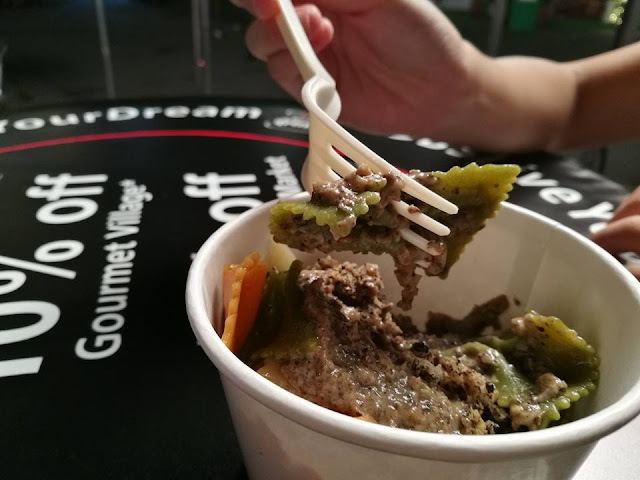 The black truffle is very rich and fragrant, melty and buttery, and every piece of the ribbon pasta is of a respectably al dente bite texture. A very small portion for $6, each of us only literally had about 10-12 pieces of the ribbon pasta each. But to be honest, I think I paid an equal amount for similar pasta in London's Borough Market, and the quality is comparable. 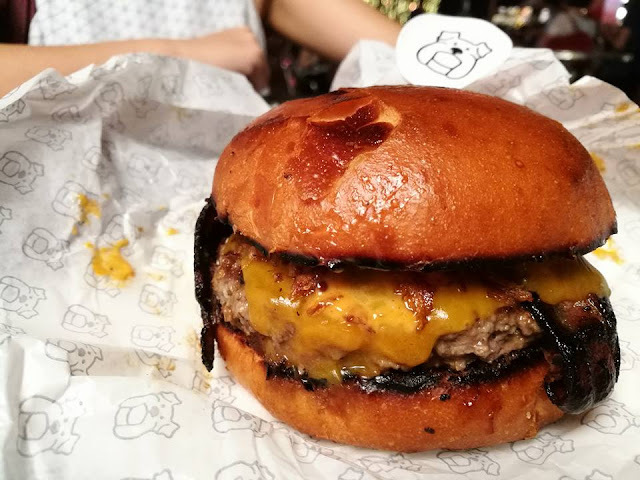 Smokin' Daddy (Burger) - SGD10.80 after disc. 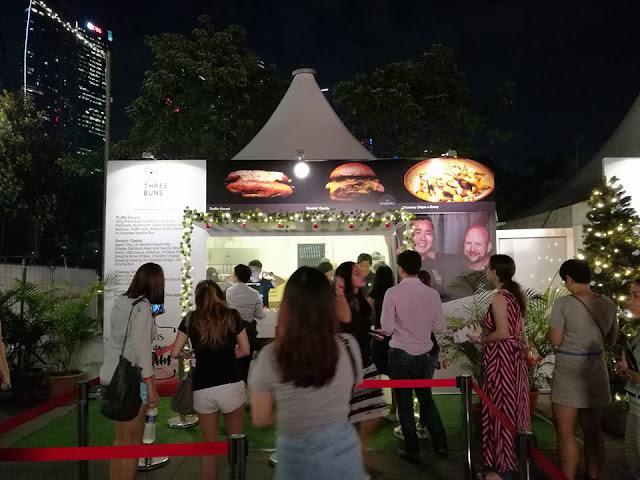 I actually don't fancy eating burgers outdoors, especially when seating is scarce and mostly occupied by larger groups, and imagine having oily juices rolling down my arm to my elbows.... ugh! BUT for Three Buns... it's freakin' worth it. I don't know how I could eat any other burgers without thinking about this one, the meat patty is so juicy and delicious, and the bread is buttered and toasted just perfectly. How did they create this magic in a tiny white tent in the middle of nowhere? OK I am sold. For $12, all I can say is: TAKE MY MONEY! Pumpkin Softie Pie - SGD10.80 after disc. They should totally rename this dessert to something that truly reflects how wonderful this creation is... I mean, how do you find such a photogenic AND delicious dessert at a food market? Eh-hem, shall not mention names about how many 'Instagrammable' desserts sprouting up over the past year that's teetering on the edge between Edible and Inedible, but this one is right smack in the zone of "Eat Me Or Regret". 👑 What is this peculiar dessert? 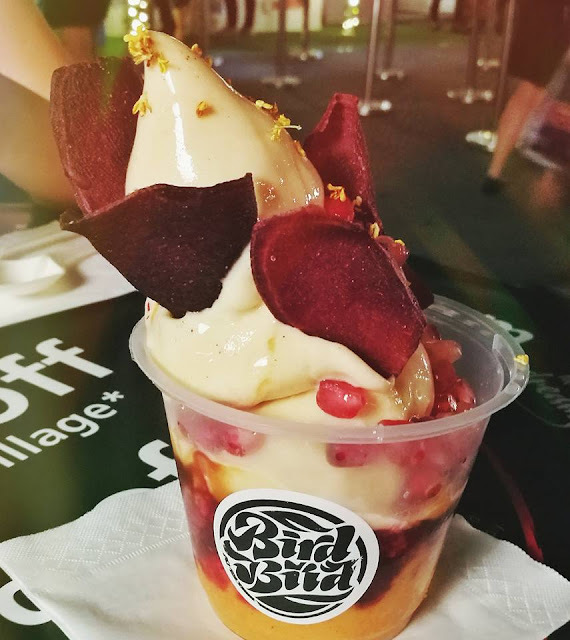 It includes eggnog ice cream with pumpkin mash, cranberry puree, cinnamon crumbs & sweet potato chips... wow, and probably some unidentified ingredients to make it soo festive and memorable. 100% drool-worthy! There were obviously a lot more fancy food that we didn't get to try, including the Hokkaido Lavendar Ice Cream Soft Serve! Definitely a regret and I wished I could eat more, but... till the next time, Savour!!! 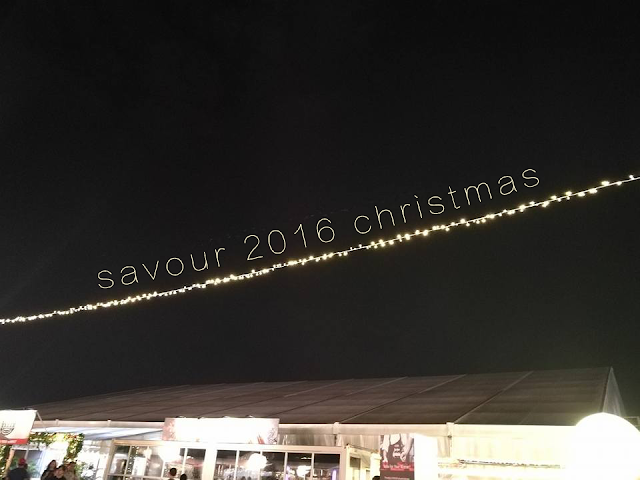 You can take a look at Savour's Facebook page here for future events.